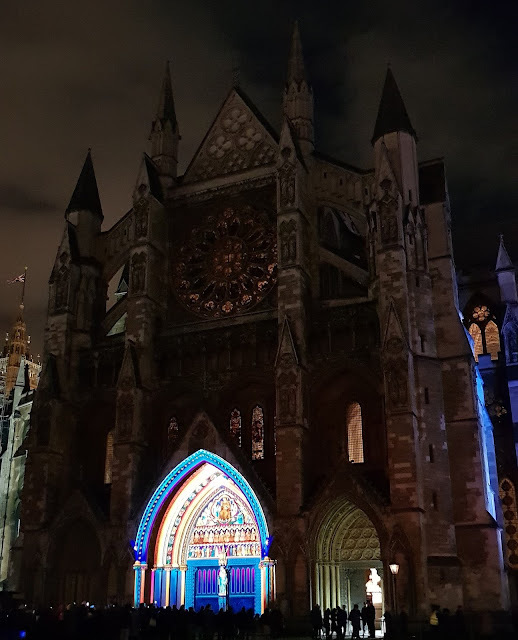 Our walk began at Westminster, where we took in The Light of the Spirit (Chapter 2) by Patrice Warrener, which illuminated Westminster Abbey. This was by far the busiest of the installations that we saw, all night. We then headed along Great George Street and on to Horse Guards Road, where we looked, briefly, at St. James's Park, where the fountains were lit up with purple lights. Across the way we could see the London Eye, rising above Horse Guards Parade, going through a myriad of colour changes. We then walked up the Duke of York of steps, passed "Giro's" grave, before heading along Pall Mall to St. James's Square Gardens. It was here that Katarzyna Malejka and Joachim Slugocki's installtion, entitled Spectral, could be found. Of all of the installations that we saw, this night, this was my favourite. We then headed up Duke Street St. James's, towards Piccadilly, and the Love Motion installation at Burlington House. From here we headed along Piccadilly, passing The Ritz, before heading along Berkeley Street to, of course, Berkeley Square. It was here that we saw Cedric Le Borgne's Was That a Dream?, which had sculptures made of light. These birds were illuminated against the night sky, on to rooftops, while one, made of wire, sat in a tree, while Frank Sinatra's rendition of Nightingale Sang in Berkeley Square, echoed around through the trees. It was a short walk along Mount Street to the Illumaphonium by Michael Davis. This unique installation allowed you to interact with it, as the chime bars were tactile and went through ever-changing patterns of light and sound, depending on how many people were interacting with it. Keilyn had a quick go, while Erin was more interested in watching the effect. IN Mount Street Gardens we discovered [M]ondes, by Atsara. This work saw circles and lines of light being projected onto the surrounding walls. However, it wasn't this simple, as, on closer inspection, slithers of wire could be seen hanging from the trees. These wires interrupted the projection making little sparks seem to randomly appear and disappear, which added a mesmerising detail to the art. Added to this, there was a soft soundtrack of chimes and water droplets being piped into the space, which only added to the magic. Bough 3, by Simon Corder, was literally around the corner on South Audley Street, where he had used neon tubes of fluorescent light, on the side of the T. Goode & Company building, which appeared be growing up the side of the building, like a climbing plant. We then followed South Audley Street to Grosvenor Square, where the Northern Lights were installed. The brainchild of Aleksandra Stratimirovic, this installation involved 100 vertical light bars, equipped with LEDs, that had been preprogrammed to bring the Aurora Borealis to Mayfair. With the temperature dropping, the time getting late and with all of our stomachs grumbling, we headed up North Audley Street to Orchard Street on to Portman Square which finally led us on to Baker Street, where we stopped for food and drink. Suitably replenished we made the short walk to Baker Street station, where we treated the girls to some sweets, before catching a train home. Obviously, there was so much that we did not get to see, but what we saw was impressive. Hopefully, as the girls get older, and providing Lumiere does return, then we can take in some different areas. Click here to see some of my photographs from Lumiere London 2018.